Cathy Isom continues her series on invasive plants letting you know about the shrubs that can be invasive and a nuisance in your garden. That’s coming up on This Land of Ours. Fruits of the ornamental japanese barberry (Berberis thunbergii). Japanese Barberry is a beautiful thorny shrub with red berries and leaves. This aggressive plant tolerates shade and drought. It requires little maintenance and pests don’t love it. 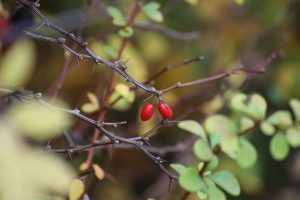 Unfortunately, Japanese barberry is a favorite habitat for Lyme disease-carrying ticks. It also competes with native species. 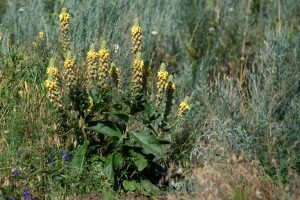 Common Mullein are small tightly packed rosettes and when the plant bolts the shoot produces yellow flowers. It’s hardy medicinal plant useful for treating respiratory illnesses. It’s also more of an annoying weed than an invasive species because it spreads quickly. Other beautiful shrubs that could be more work than their worth include: Purple Loosestrife, Bachelor’s Buttons, and Butterfly Bush. Bottom line, do your homework and research the best shrubs for your gardening needs, and native in your area, to avoid headaches later.